The remote South Sandwich Islands are only very rarely visited. We were more than lucky and even managed a landing on Saunders Island. As far as we know, it was the seventh only in the history of the island. 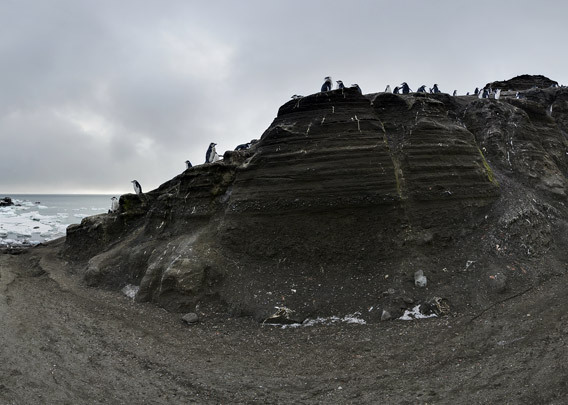 I managed to get several 360 degree panoramic images on Saunders Island and as far as I know, they are the first ones ever taken on the South Sandwich Islands. You can find the panoramas at the end of the page. 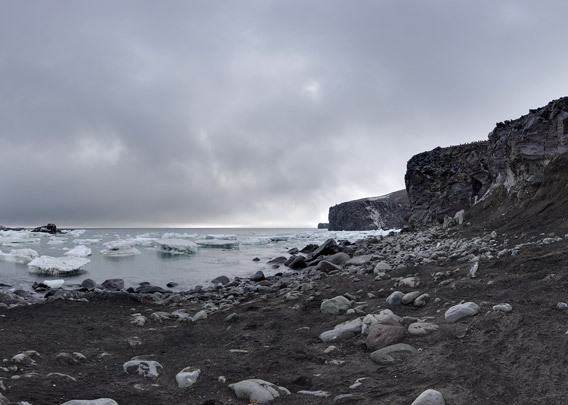 More panoramas on this website in the collection of Antarctic Panoramas. The South Sandwich Islands are an activ volcanic arc of islands. They are partly south of 60° and then accordingly in Antarctic Treaty area, others are north of that parallel and are governed together with South Georgia as a British overseas territory. Mount Michael on Saunders Island is one of several active volcanoes there, it is likely to have a lava lake in its central crater, one of few on the world. But there was of course no chance for us to see it. But what we did see was large parts of the slopes steaming at times. The slopes were fascinating in several ways, not only the steam, but also the dark, volcanic colour and the regular erosive gullies cut in by meltwater streams provided some stunning views. 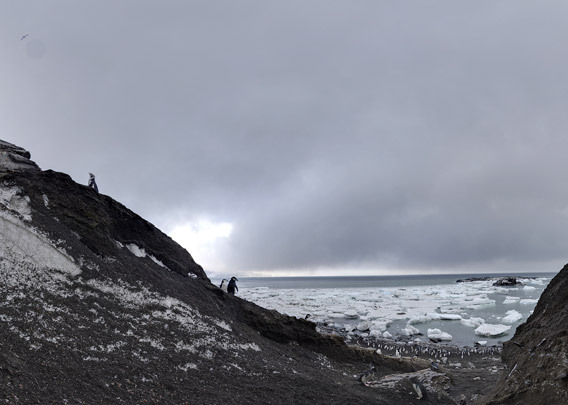 Penguins, mainly Chinstraps, in large numbers near the shore and further up the slope. A bit further north, a large colony in an amphitheatre-shaped valley could be seen from the ship. To our surprise, we also found a slightly lonly Maccaroni penguin and a leucistic Gentoo. 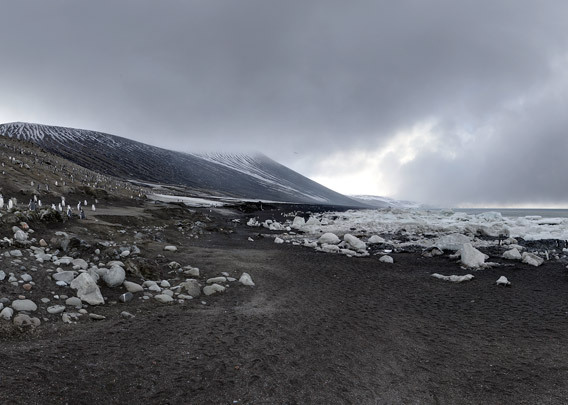 When we arrived in the very early morning, Saunders Island was initially hidden by low clouds and strong winds made any potential landing very unlikely. But the cloud lifted, and the wind stabilized below 30 knots, so we gave it a try. 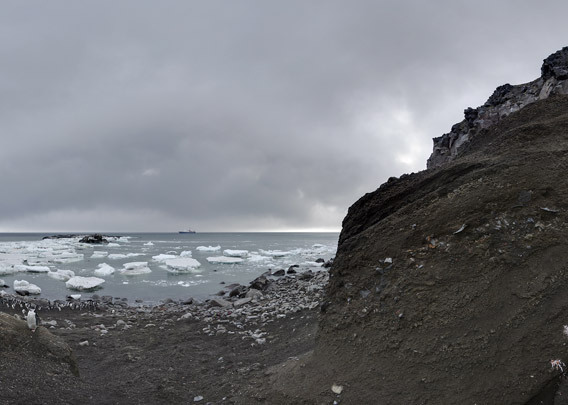 The large drift ice fields in the area certainly made it a bit easier by calming the swell down, with is otherwise a permanent obstacle on those exposed coasts. We found a suitable channel in the ice belt near the shore. So that was our chance, and we took it. The channel closed once the last boats were on their way out – we had really used our window of opportunity, and it may be long until the next one comes! We found large fields of dense drift ice immediately south of Saunders Island, and the visibility went down again soon, so we set course west, slightly to the north, to get out of the ice. We had certainly had our share of luck in the South Sandwich Islands, and pressing for more would most likely have been rather foolish, so rather than wasting time, we headed towards the South Orkney Islands and the Antarctic Peninsula. 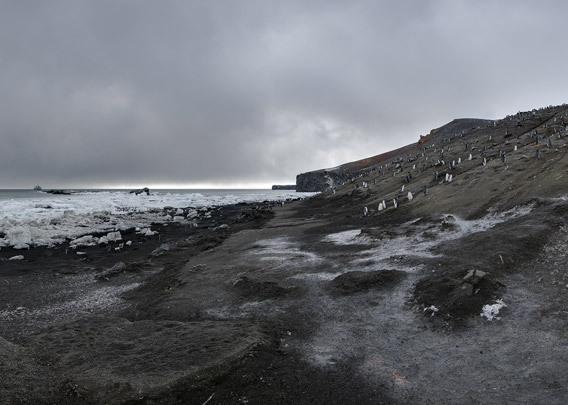 Due to the ice, we should not reach the former, so it was Elephant Island that we reached after four days of sea after leaving the South Sandwich Islands.